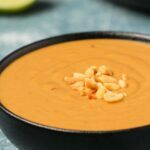 Creamy vegan peanut sauce with a delicious tangy zesty flavor and just the right amount of spiciness. Ready in minutes and perfect as a dip or sauce. 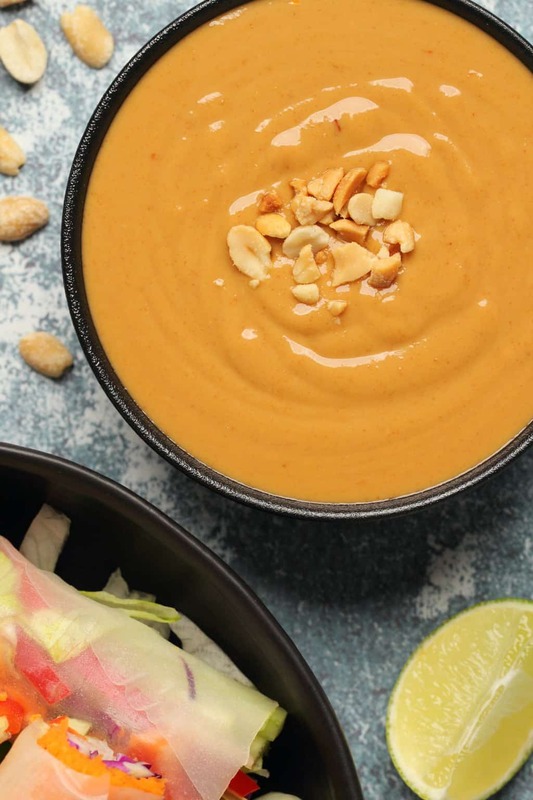 We are just crazy about this vegan peanut sauce! Ever since we made it we’ve been eating it with everything. Of course all the spring rolls you see pictured here were gone in minutes, but then we had some leftover sauce and that has been used as a salad dressing, a sauce for noodles, a dip and just stirred into curry. Jaye even went out and bought some fried spring rolls especially to dip into the leftover sauce. 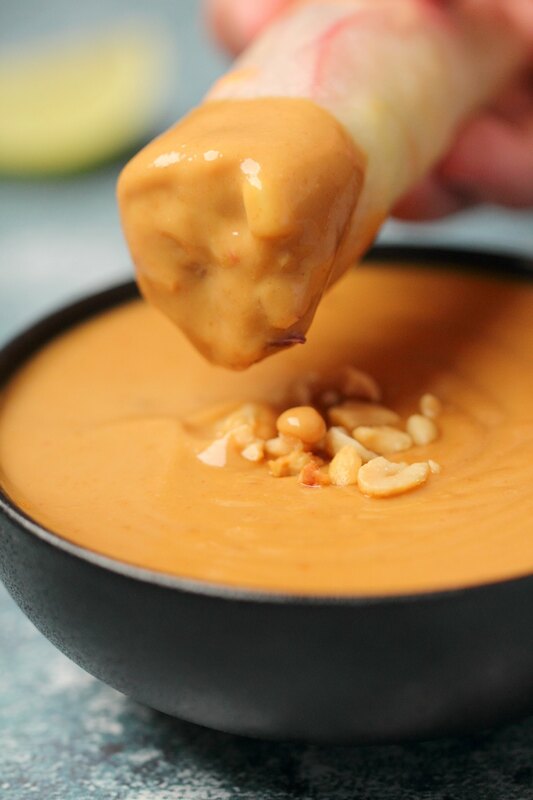 It’s creamy and tangy and zesty, ever-so-slightly spicy and just wonderful for dipping all the things! Making it is so simple. It’s just a case of throwing all your ingredients into a measuring jug and whisking it up into a smooth sauce. 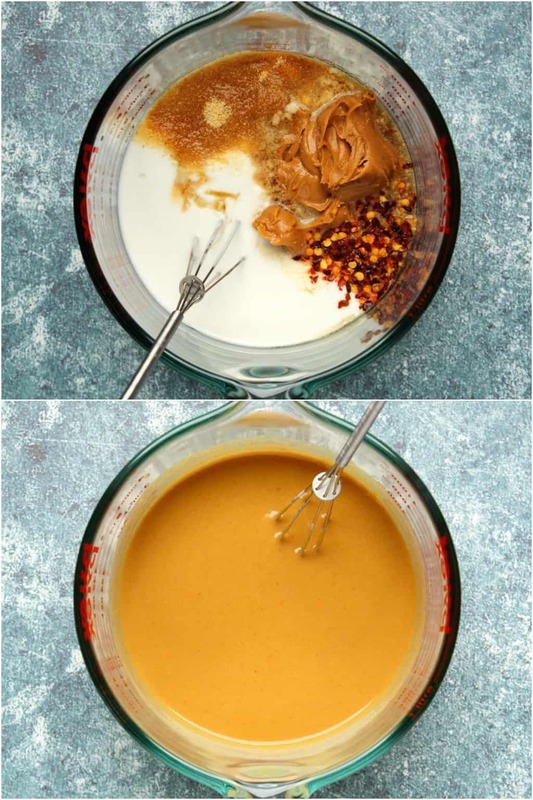 As long as you have a jug (or bowl) and a whisk you have everything you need to make the perfect peanut sauce. 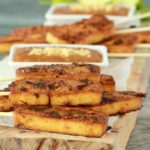 The ingredients are an easy mix of peanut butter, coconut milk, soy sauce, rice vinegar, maple syrup, garlic powder, ground ginger, fresh lime juice and some crushed chili flakes (full details are in the recipe card at the bottom of the post). 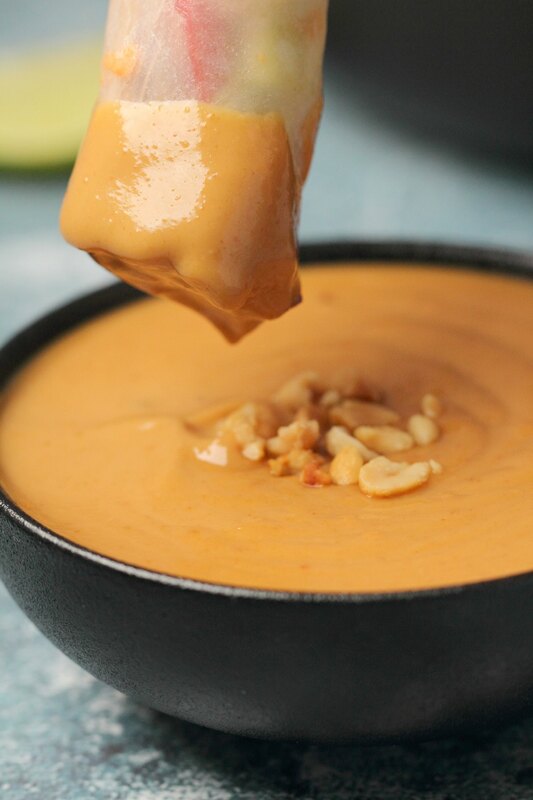 The most delicious peanut sauce! We used a smooth salted commercial brand of peanut butter, but I’m sure a natural peanut butter would work too, just make sure it’s well mixed first. 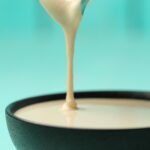 We used full fat canned coconut milk but if you want to use a different non-dairy milk I don’t see an issue with it, but it will of course have an impact on the resulting flavor. 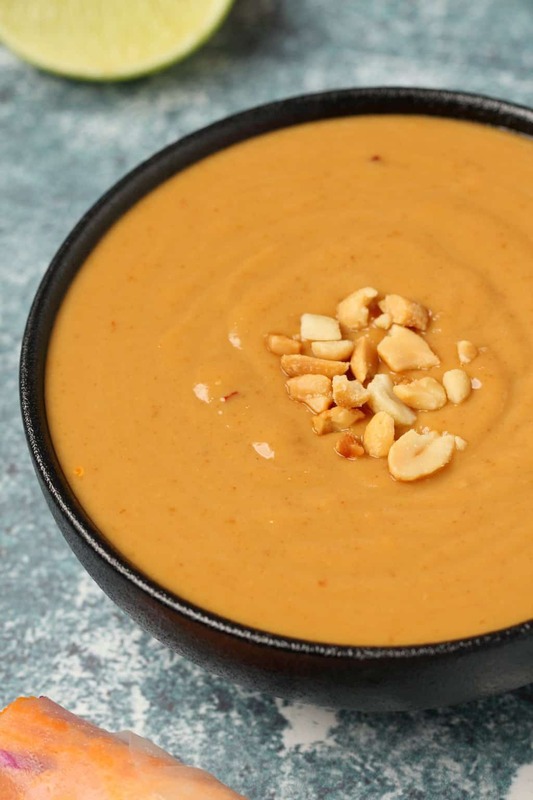 If you use a thinner plant-milk like almond milk then the sauce will have a thinner consistency. The fresh lime juice adds the perfect amount of tang! In a pinch you could use lemon juice instead, but I really love the flavor that the lime juice adds to this. If you have any trouble finding dried chili flakes, you can switch this for cayenne pepper. It just gives the sauce a small amount of heat. Of course if you like things spicy you can always increase the amount of chili flakes or cayenne! 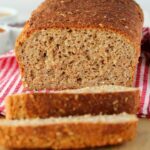 Keep leftovers stored in the fridge and enjoy within about 5 days. 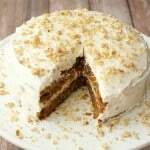 It tends to thicken up in the fridge, so if you want to thin it out you can add a little water to it and whisk it in. 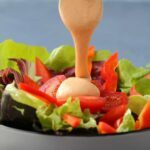 More delicious vegan sauces and dips! 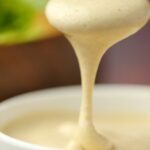 Our classic vegan cashew cheese sauce is wonderful drizzled on baked potatoes or pizza! 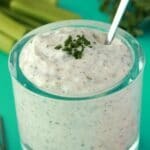 Our vegan onion dip will always impress as will our creamy eggplant dip and vegan queso! 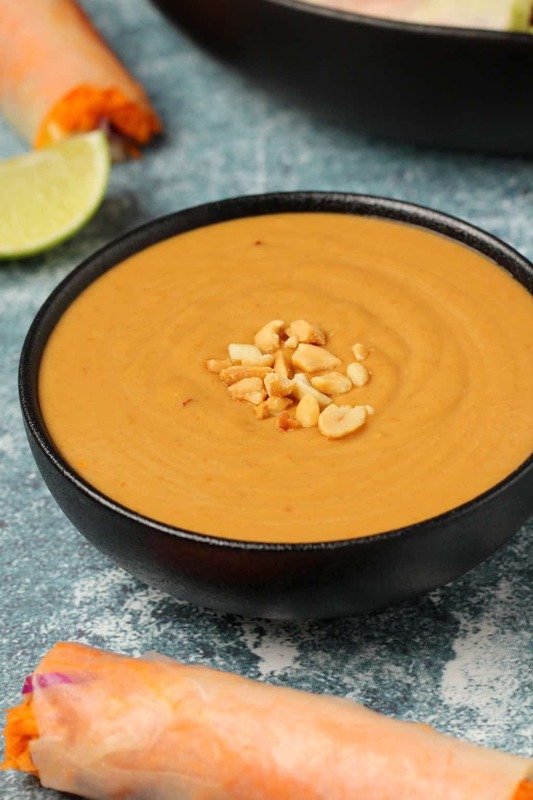 So let us know what you think of this vegan peanut sauce in the comments and please rate the recipe too, thanks. 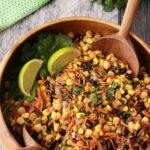 Sign up to our email list and we’ll send you a gorgeous (and free) recipe ebook containing 10 delicious vegan dinner recipes and you’ll be the first to know when new recipes are posted to the blog. Am I off the mark here or could this be used as a salad dressing if thinned? Another superb tangy and spicy dip. 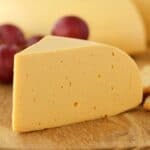 Creamy, smooth and so tasty! 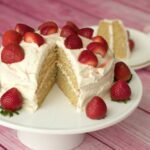 Have added this to my bookmarked recipes. 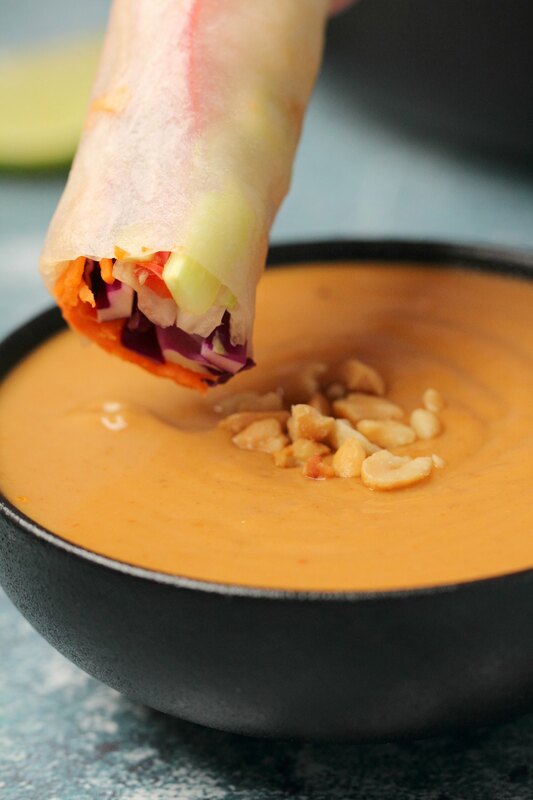 I love anything savoury with PB – and I have some vegan spring rolls sitting in my freezer….. what more can I say?